Recorded natively in the PCM format at 176.4 kHz/24 bit and converted to DSD using the best equipment available. Also available as a FLAC and ALAC download. Selected by SoundStage!.com as one of the "Best Recordings of 2001"
Chosen by THREE reviewers of The Absolute Sound magazine as one of the best releases of 2001. Sergei Rachmaninoff was one of the most beloved composers of the twentieth century. His music is redolent of his Russian homeland, and it sings long, lush melodies that define the term "romantic." Everyone who knows and loves his piano concertos will enjoy these lyrical and dynamic works for orchestra. 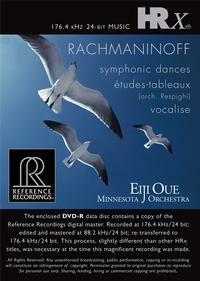 The "Symphonic Dances" in recent years have become one of Rachmaninoff’s most-performed scores. The five "Ètudes-Tableaux" were orchestrated by Ottorino Respighi from the brilliant originals for piano. "Vocalise" is one of the great classical melodies, and is hummable by everyone. Initial response from renowned reviewers is amazingly positive. Two have said this is the finest orchestral recording RR has ever made!